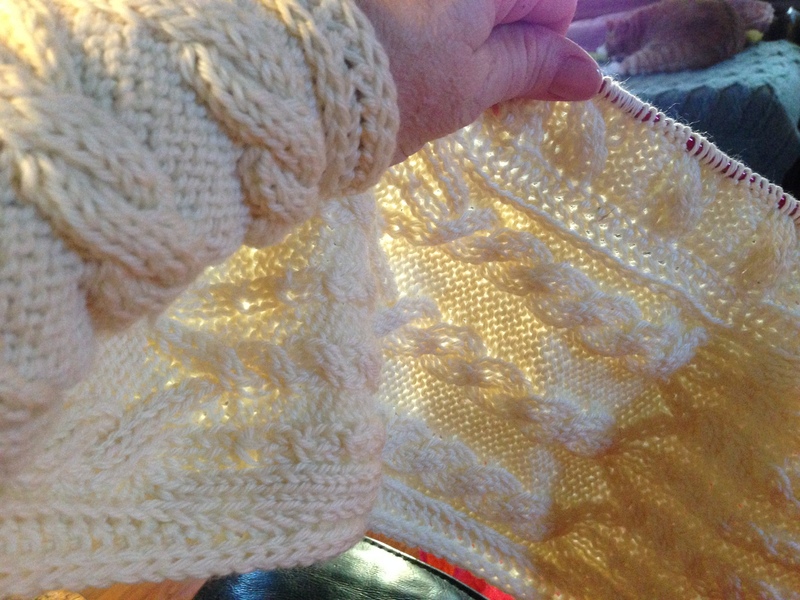 This entry was posted in Knit Along, Knit Technique and tagged #SplitCableWimpleKnitAlong, Cables by Annie Modesitt. Bookmark the permalink. The two YO’s as written will NOT line up in the new chart perfectly, I’m sorry. You can certainly shift it over, but to be honest where the YO happens just above the cable will not be crazy obvious, and the pattern will work well as written. I wish my brain were more – flexible – right now, but I’m having a hard time seeing through this. Thank you for your patience! I’m feeling successful! I’m a lace knitting toddler. My mind boggles when confronted with a chart. HOWEVER, I’m actively making progress! Because I’m a chicken, I run a life line after every few rows, alternating two lines. When I pull out one, after placing the second, I ‘stair step’ up the pattern. I’m having fun! Thanks, Annie!